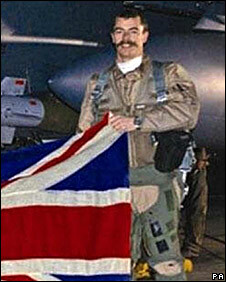 An RAF fighter pilot has won his battle with the United States Air Force over the size of his handlebar moustache. Flight Lieutenant Chris Ball, who is on an exchange posting with the USAF in Afghanistan was told to trim his distinctive moustache. The pilot, who is usually based at RAF Lossiemouth, turned to the Queen's Regulations and found the moustache's width did not breach RAF guidelines. The rules state the moustache should not go below the edge of the mouth. Despite Flt Lt Ball serving on exchange with the USAF, the RAF still have some say on the attire and appearance of their staff. The USAF relented and Flt Lt Ball's moustache was left unruffled. An MoD spokeswoman said: "Queen's Regulations for the RAF (QR209) state that if a moustache is worn, the upper lip is to be unshaven and the moustache is not to extend below the edge of the mouth. "The commanding officer shall be the arbiter as to what is or not an acceptable style or length of cut. "A Memorandum of Understanding (MOU) exists covering the exchange of Officers of the Royal Air Force and the United States Air Force. "The MOU states that 'Officers are to comply with the dress regulations of their own Service and the order of dress for any occasion is to be that which most nearly conforms to the order of dress of the unit with which they are serving. "Local commanding officers should not issue instructions to officers which cannot be fulfilled by reasons of difference in dress regulations." Moustache aficionados were delighted that Flt Lt Ball could continue to sport his facial hair. Rod Littlewood, vice president of the London-based Handlebar Club, said the RAF had a long association with the moustache. "We are delighted with this result, it's one in the eye for these people - a moustache is all about individuality," he said. 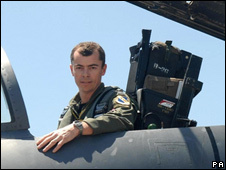 "One theory behind the association between airmen and a hairy top lip was to make young pilots look older." He added: "During the Second World War a lot of these chaps signing up to fly were pretty young. "A moustache would certainly make them look a lot older and more manly." Mr Littlewood, who sports a large handlebar moustache, said: "The moustache is not that popular in the UK at the moment but as far as we are concerned they have never gone out of fashion. "Everything goes around in circles and I don't see any reason why they shouldn't become more popular. "Of course the handlebar is the most sought after - it's big and bushy and swishes across the top of the lip."